The beets have been beautiful at the Green Market this month and I am in beet heaven. I don't know how I could have ignored them for so long, but I've been more than making up for it these past couple of years. We've also had a pretty mild summer, for which I am most grateful. But I know the heat will be coming soon and I am always on the lookout for light, easy dishes that require little cooking and can be eaten cold. My gazpacho has always been a reliable standby, but every now and then you want something new. I don't know why I've never made borscht before. I guess maybe it's because I hated beets as a child, so borscht was yucky by association - just the thought of it was enough to make me gag. Thank goodness I have gotten over that. I love me some beets! The Polish restaurants in Chicago offer borscht as one of the buffet options and I have gotten into the habit of ordering it there. So I guess it really wasn't that much of a stretch for me to finally decide to try my hand at it. I was at the green city market with a friend and bought two beautiful bunches of beets. I usually enjoy beets in salads and the occasional saute, but they were so red and so beautiful that I just knew I wanted to make borscht. I stopped at the Apple Market on the way to home to buy some beef stew meat for the soup, but when I got home and started looking at all the recipes, the beef versions all involved a lot of cooking and looked like they would make a heavy cold-weather soup. I wanted something lighter for summer so I threw the beef in the freezer and will do something else with it. I looked around a little bit more and found some lighter recipes. I took ideas from all of them and came up with a bright, refreshing summer soup that is a breath of fresh air on a warm summer day. A little sweet, a little tart, a lot of flavor. And beautiful too. This picture does not do justice to the almost flourescent magenta hue the dish takes on after stirring in the sour cream. It practically glowed in the dark. I have already made this a few times this summer, and I have learned a thing or two. You might be tempted to chop the beets in the food processor instead of grating them. It was not terribly successful. It grated most of the beets too fine, and left several bigger lumps as well. It doesn't take long to grate them, and it ensures a nice, even texture to the soup. 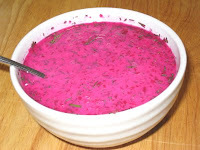 Several of the recipes I looked at said to use the cooking water for the soup, but the first time I made it I drained the beets before I remembered that I needed the liquid. I used my vegetable stock and found that I liked it better than a later batch when I did remember to use the cooking liquid from the beets. The beets came from the green market, so they were probably more expensive than they would have been had I bought them at the grocery store. Even so, this soup comes in at a bargain. Wash beets thoroughly under running cold water, making sure to remove all dirt. Trim the leaves from the beets, leaving about an inch of stem still on the beet. Do not remove the root. Place in a pot with cold water to cover and bring to a boil. Reduce heat and simmer until beets are knife-tender (a paring knife slips easily in and out of the beet), about 40 minutes, and drain. Let cool. Cut the tips and the root from the beets and, using fingers, rub off the rough outer peel (to see how it's done, check this post). Beets should be smooth and somewhat slippery. Pour 4 cups of vegetable broth into a 3-quart saucepan. Grate the beets into the vegetable broth, then bring mixture to a boil. Reduce heat to simmer and add lemon juice and sugar. Season with salt and pepper to taste. Cook at a simmer for about ten minutes, to allow flavors to blend. Taste and adjust for sugar/lemon juice balance. Add salt and pepper as desired. Remove from heat and add dill. Chill before serving. 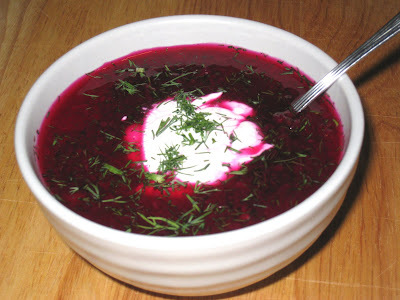 Serve with a dollop of sour cream, to be mixed with the borscht just before eating.